I will be 29 on June 19th. Officially a geezer. Older than dirt? Not yet. I am not much of birthday-celebrating-type guy, but this year, I would like my birthday mean something different. I’m donating my birthday to charity:water— an organization dedicated to giving people access to clean water. They have had a tremendous success over the last three years and have drilled 1017 water wells in Ethiopia alone giving 455,711 people access to clean water. But, instead of citing more statistics or show you charts about how dire the situation is, I thought I’d tell you a little bit about my dad and his water well drilling rig. Here is the setup: rewind 14 years. We were in Ethiopia and I was only 15. One evening, my dad came home rushing to sit on the family dinner table. Much to my mom’s chagrin, this was a normal occurrence in our household. It usually meant, he has something in his mind and he wants to sketch out while it’s still fresh in his mind. Drafts man by training, he tends to explain things in straight lines and circles than words. But that night, it was one of those ‘aha‘ moments. After bowing his head over things he was sketching on pieces of paper for hours, he rose and resolutely said I will build a water well drilling rig. Driving to another meeting earlier that day, he has seen a water well drilling machine somewhere on the road for the first time and the sight had inspired his wonder. As he did many times before, when there was a shortage of soap or food in Ethiopia, he saw himself as the guy who would build machines to solve these problems. He was the first person to build a dough mixer, soap machine, satellite dish, etc.. in Ethiopia. You see, for his technical mind, building a water well drilling rig was the next logical step. He said to himself, Ethiopia needs clean water. He was the guy who will build the machine in Ethiopia that can bring clean water from beneath the ground by communities for whom water or the scarcity of water meant life or death. He had to see the rig in reality, tonight. As many in his generation, he is an impatient and relentless man earning his nick name from his friends “endeT ad’ro” loosely translated as “I want it yesterday”. 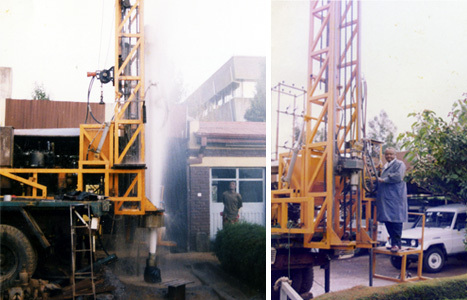 …and then, on a faithful afternoon in 1999, his rig successfully drilled 40 meters and the clean water came gushing out of the earth into in the air. I have never seen my dad that happy! He finally figured an elegant solution. His proved himself yet again that his dream of giving access to clean water to those in need was technically solvable. Now, as my dad tried to do then, charity:water is tackling the same problem at a larger scale. So, my friends, as I turn another year in my life and grow some more grey hair, I ask you one thing: Would you to be kind enough to join me in reliving this memory by donating $29 to my campaign at charity:water? It will mean clean water to those families who are in desperate need. And, it will mean the world to me. Published by .mike June 10th, 2010	in African, Childhood and Family. I have to say that this is one of the most inspiring articles I have read in a very long time. I knew your pops was the first to build a satellite dish but didn’t know the extent to which his innovations/inventions went. He is like the abesha Edison/MacGayver/hacker. I have just found a new hero. Dude! you have to write more about him and or maybe arrange a session where he can tell us what he did in more detail. I love this story and I agree with u nyalasmoke we need to hear about such heros amongst our midst and celebrate them, tell and retell their stories rather than keep silent out of humility thinking its boasting sharing these stories etc. we need these stories to know that we are capable…that we have amazing ethiopian role models! I too agree with you all. This is by far the most inspiring article ever posted. @Mike, you’re dad, in my book,is a gigantic hero. Happy “Bufday” homie!!!!! fast paced ,informative ,inspiring,heartfelt and simple .Loved it .If only we had more ethiopians like your dad ….. Happy birthday man!! I dont know if it’s going to feel differently for the next 5 years…. However, this is what I wanted to say regarding drilling wells in Ethiopia. It’s like nike coming in and providing free shoes to the thousands of displaced refugees trecking through a desert somewhere in Africa. It’s nice but its not an ultimate solution; just a temporary fix which will have to keep coming. Drilling wells in Ethiopia is kinda the same thing. The wells will dry out and new ones will have to be drilled. Ethiopia is blessed with more than 10 mighty rivers. Drilling wells should not be the solution to water shortage. Everyone knows this. The rivers’ water is either wasted or diverted to supply the agricultural and industrial ventures of foreign investors who’re looting the nation. Give the indegenous people a voice and they’ll tell you how to keep the water flowing for them. This is not to take away from your dad’s achivements. Besides, he doesn’t need me to speak for him. But, I thought this was primarily a post about water shortage in Ethiopia and how to solve it. @getu – thanks for the birthday wish. for your other comment, tell that to the person who drank a clean water for the first time in their life or a sister who lost her brother to cholera. you’ll get an answer there. Awesome article, thank you for posting this. you so right on this one. but i think for the years to come i cant picture any better and effective way of givin clean waters to those who r desperately seeking it…your solution is long lasting and so true but it takes ages to do it.I think! Happy birthday!! And what a testament to my personal hero and “your dad” for raising such a wonderful son. all over the web without my authorization. Do you know any techniques to help stop content from being ripped off? After study a couple of of the weblog posts in your web site now, and I truly like your method of blogging. I bookmarked it to my bookmark web site list and shall be checking again soon. Pls try my web page as well and let me know what you think.